For many avid readers, Amazon's Kindle store is the apex of the e-book world, offering a library of electronic books that is not only incredibly large, but also quite well priced for the most part. Chances are, if there is an e-book you want to buy, the Kindle store will have it for a reasonable price. 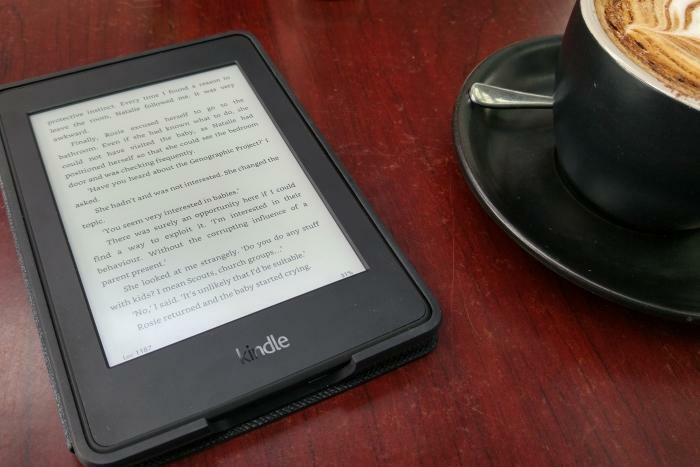 If you've already amassed a big collection of books from the Kindle store, or if you're planning to buy more books from there in the future, then a dedicated Kindle reader is also a must. The 2015 version of the Paperwhite that we are reviewing here is worth your most serious consideration. Not only do you get a 6-inch, E Ink screen, which is easier on the eyes than any smartphone screen you may be used to reading on, you also get a 300 pixels per inch (ppi) resolution that will display text with superb clarity, and there is a built-in light so that you can read in the dark. The last e-book reader that we looked at, Kobo's Glo HD, also had a 300ppi screen with a light, and we can attest that it looked magnificent. This Paperwhite is no less magnificent, and perhaps more so. You don't notice any bleeding from the light at all as you read, which makes for a reading experience that is perhaps as immersive as it gets without actually holding a real book in your hands. What we mean is, you don't tend to think about the technology you are using while you read on this Paperwhite e-book reader. At certain intervals you will notice the page refresh (that is, a black flash for an instant), which is done to rid the screen of ghosting (remnants of text from a previous page), but we noticed no ghosting at all on this screen. Page turns were quick, too. It's a little heavier than the Kobo Glo HD, but we're talking a difference of only 47g, with the Kobo being 180g and the Kindle being 217g. The Kindle feels more refined in its design. It has a curved back that provides a grippy texture to hold, and the border around the screen doesn't have any reflective bits that can cause distractions while reading -- again, this lack of distraction adds to the immersion of the reading experience. A beautiful E-ink screen that's easy to read in all types of settings. To turn the page, all you have to do is tap one of the dedicated zones on the touchscreen. A tap within a couple of centimetres of the left edge will take you back a page. A tap in the vast space to the right of this virtual column will take you to the next page. A press within a couple of centimetres of the top will bring down the menu, from which you can change settings and the look of the page. Because of the dedicated tapping zones for page turns, you can easily use this e-book reader with one hand. It doesn't go as far as the physical controls that are present on the high-end Kindle Voyage -- on that e-book reader, you don't even have to lift your thumb off the bezel to turn the page, just squeeze the bezel a little. But that is a premium reader with a higher price, and is perhaps a little too funky for most. This Paperwhite is designed to be more affordable, even though its screen is just as good. 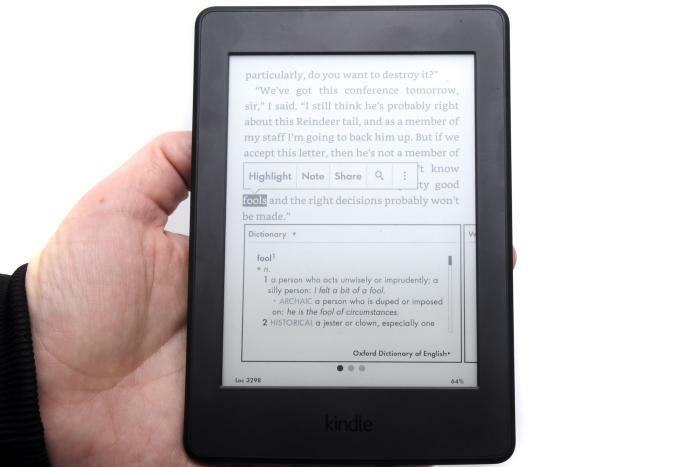 One of the most appealing aspects of e-book readers such as the Kindle Paperwhite is the ability to change the font size to suite our eyes. There eight font sizes to choose from, and all of them, from the smallest to the largest, are rendered with a smoothness that is sublime. 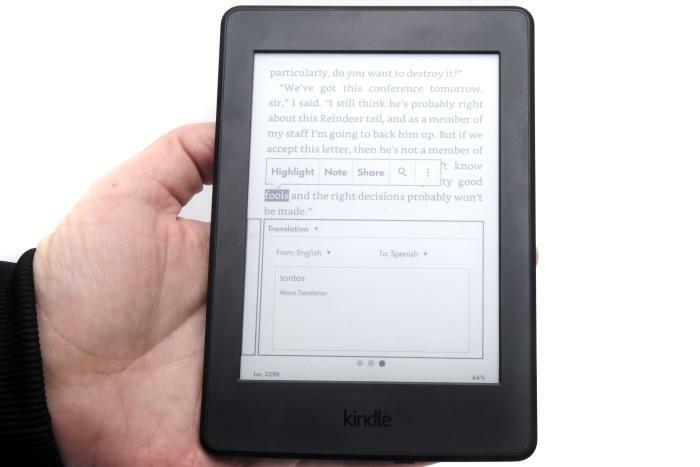 Amazon claims that the Paperwhite adapts the text to fit the screen without leaving too much whitespace or broken words. We can say that we didn't notice any such symptoms while reading primarily at one or two sizes bigger than the default. Further to size, you can also pick from a selection of seven font styles (serif and sans serif). We found the default 'Bookerly' serif font to be most pleasant and didn't want to change it. It's a font that Amazon claims has been "crafted from the ground up for digital reading". We agree that it's perfectly fit for that purpose. 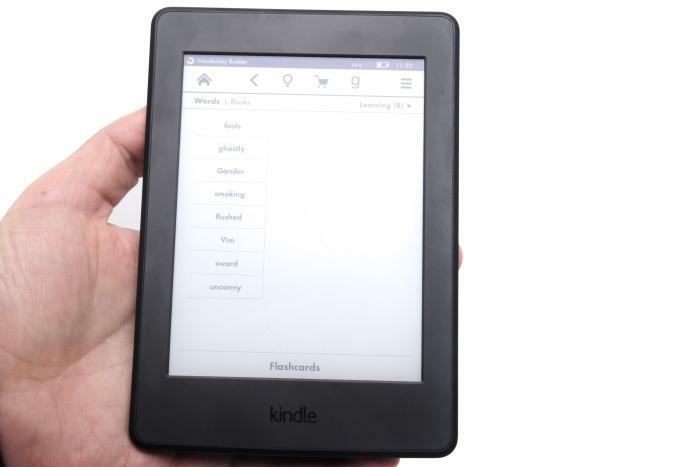 Other features that can be found on this Paperwhite include a dictionary, a translator, and Wikipedia references that can pop up whenever you select a word. There is a vocabulary builder that adds words you look up to a list that you can then use to test yourself with, and a 'Word Wise' feature is available on some English books that can help make books with challenging words easier to read. Sharing of passages is possible via Twitter and Facebook if you connect your accounts. Translation is available to a selection of languages. 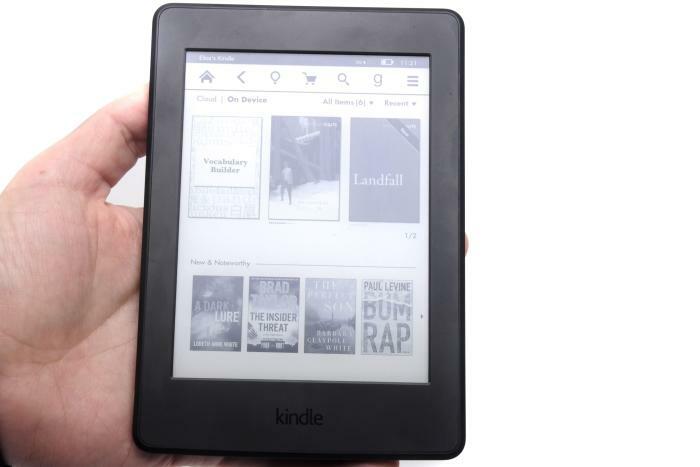 Books from the Amazon Kindle store are downloaded to the Paperwhite reader over Wi-Fi or 3G. We recommend Wi-Fi wherever possible. In fact, unless you want the ability to buy and download books from almost anywhere, any time, then we suggest saving money and going for the Wi-Fi version instead. A drawback that we noticed with this device is its battery life, which didn't last as long as it should have. We had to charge it every week, and we think that this is due to the use of 3G. We found the 3G connectivity on this reader to be particularly slow in some locations when displaying online content or trying to buy books. On the Kobo Glo HD, one of the things we loved was the ability to use Pocket to read articles saved from the Web. The Kindle Paperwhite doesn't support Pocket. We also appreciated the Kobo's ability to display book covers. The Paperwhite just displays stock images, rather than the cover of the book you are reading. Nevertheless, our overall experience with the Paperwhite is about as positive as gets in terms of the reading experience. As with many e-book readers these days, we didn't want to put it down once we found a good book. The text looked sharp, the light didn't bleed or burn too brightly, and page turns were swift and easy to manage. All up, well worth considering, especially if you opt for the Wi-Fi version, which costs $179 compared to $249 for the 3G version. While it works best with Amazon's Kindle store, you can certainly load DRM-free books onto it from sources such as Smashwords. You just download the 'mobi' file format for the book, and then drag and drop it to the 'documents' folder on the Kindle after you've connected it to your computer via USB. It will also support text files, Word files, and PDFs. The Kindle Paperwhite's main screen.